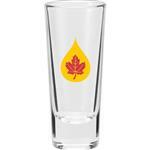 The classic custom shot glass with an added touch. 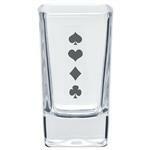 2 oz clear shot glass with tapered sides and a cut glass pattern base all with your logo. Production Times Available: 5 working days. Rush available. Dimensions: 2-7/8" x 2 1/4". Typical Imprint Area(s): 1 x 1-1/2 x 5"
Available Imprint Options: Two sided imprint included. 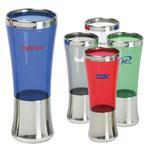 2 oz shot glass, Made in USA. Clear cut glass.